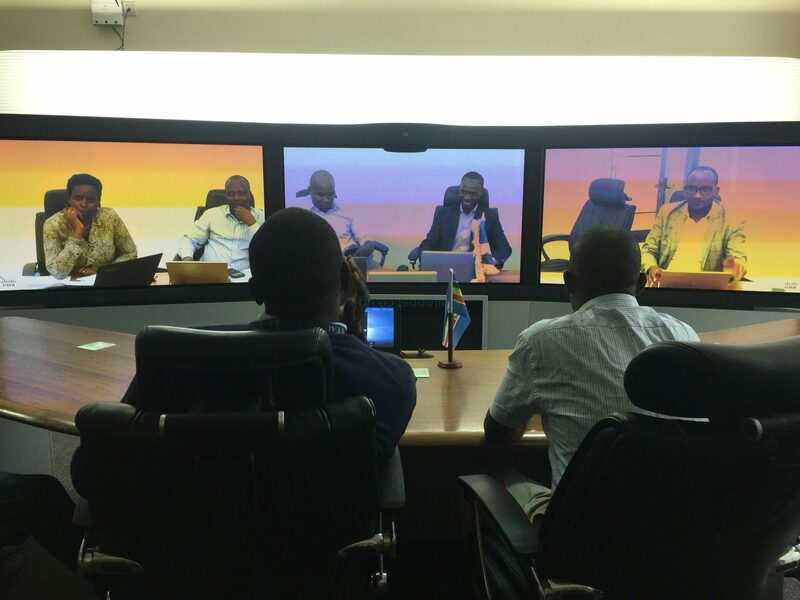 A video call placed by the East African Community Secretariat to the Ugandan Ministry of East African Community in Kampala left a group of journalists from different countries shocked, and their Ugandan counterparts shamefaced when it revealed offices were completely abandoned during working hours. A group of journalists from East African member states were in Arusha for a Youth leadership conference organised by the EAC Secretariat and Deutsche Gesellschaft für Internationale Zusammenarbeit (GIZ) on November 20, when they were invited to tour the EAC offices along Lodge Road in Arusha, Tanzania. 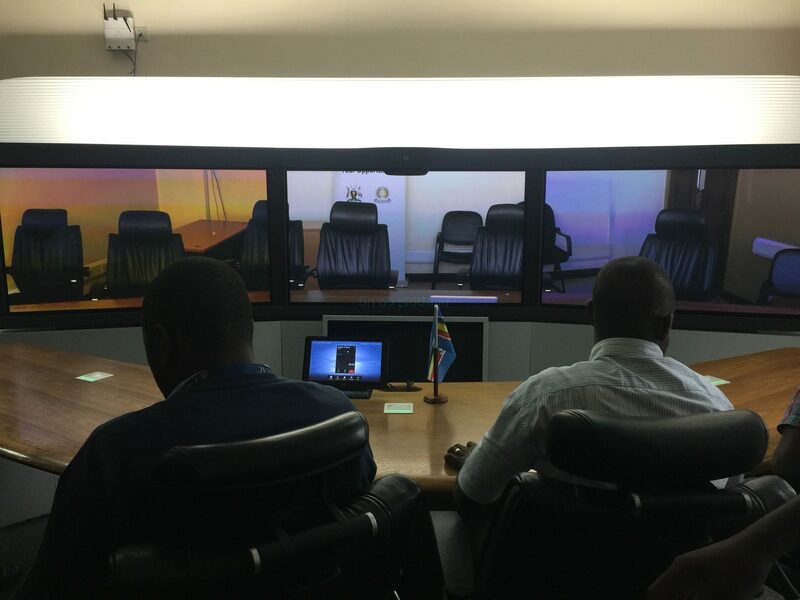 A fruitful tour would then be climaxed with a trial of a state of the art video conferencing system that was introduced at the secretariat in 2015 with aim of reducing staff and travel costs at the EAC secretariat and member states, as well as ensuring cost-efficiency gains in communication and decision-making. “This system ensures enhanced efficiency in communication and saving on travel costs. We use it mostly for meetings involving high level ministers so that there is no need to incur costs bringing them here,” our guide expounded. “We use ISP bandwidth to ensure no breaking in communications and engineers keep monitoring the system,” he added. As part of a demonstration, a call would be placed to each member state office represented by the different journalists for a brief interaction. Immediately, a call was placed to Nairobi Kenya and was received by an attendant who murmured an apology quickly and asked the person on the other end to hold on shortly while she calls her immediate boss, a one Mburu. 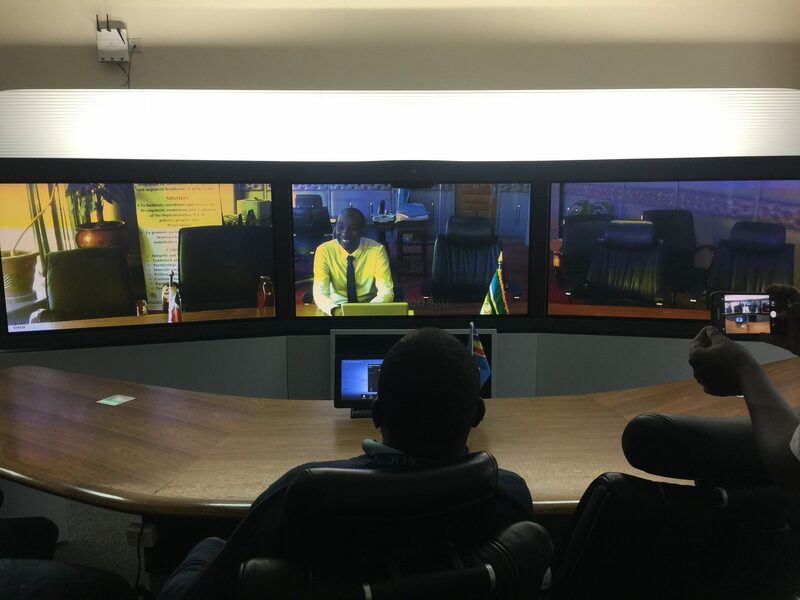 Mburu interacts with a Kenyan journalist on Video Conference System. Mburu set himself fit for the interaction and quick questioning from James Gitau, a Kenyan journalist attached to Daily Nation. The two exchanged greetings in Swahili before Gitau asking for a details on the benefits of the system. 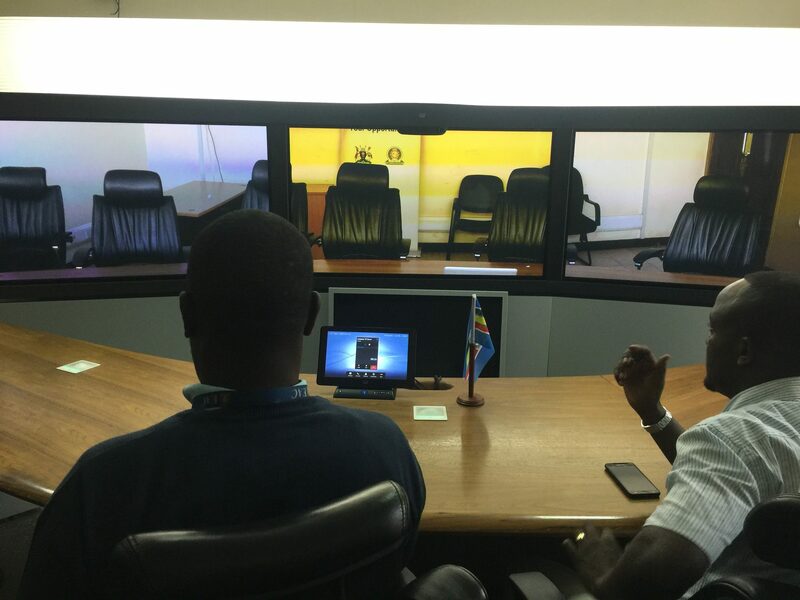 The next call was placed to Rwanda EAC in Kigali where all officers were present (All set five seats were occupied). The Rwandan journalists; Dan Ngabonziza of KT press and Eugene Kwibuka of New Times, were spoilt for choice, pushing themselves back in their seats and opening up a whole meeting with their ministers about the system, albeit in Kinyarwanda. Rwandan Journalists interact with a five-member EAC team in Kigali. Indeed, a call was placed to the EAC offices in Kampala, and there were neither jackets nor their owners, completely abandoned and empty offices. “It doesn’t look like there has been someone in that office even in the last few days,” our Kenyan counterpart exclaimed. There was sinister laughter in the room, as Ugandan journalists clung on all courage they would muster to move past Kampala no-show. In any one year, the EAC holds approximately 850 meetings. All meetings require travel to the Secretariat in Arusha or to any of the five Partner States. The total travel budget for the Secretariat– let alone the entire Community – is in excess of $13 million a year. The total anticipated savings (in air tickets, allowances and hotel expenses) for the Secretariat is estimated at $1.3 million every year assuming only 10% of the meetings are conducted via Video Conferencing. This constitutes a significant reduction in current spending on staff travel. In sum, the VC equipment will assist the Secretariat to improve the EAC’s management of its financial resources. Uganda’s EAC Ministry is headed by 2nd deputy Prime Minister and Minister for East African Community Affairs, Dr Kirunda Kivejinja and State Minister Maganda Julius Wandera. It should be noted that Uganda is currently chair of the EAC having taking over from Tanzania in April last year. In August 2018, members of parliament accused the EAC ministry of laxity following low performance of Ministries, Departments and Agencies (MDAs) in mainstreaming the East African Community (EAC) Integration agenda. However, Minister Maganda attributed the poor performance and laxity to poor funding.